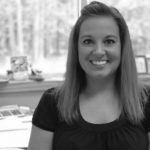 When I first started at Pike Lake Dental Center nearly 20 years ago, our dental technology was very different than it is today. The constantly evolving technology is one of my favorite aspects about the dental field. I also think it helps keep our staff interested in and enjoying their jobs. I am a huge Will Ferrell fan. Have you seen the movie Talladega Nights: The Ballad of Ricky Bobby? Here’s one of my favorite quotes from the movie, even if it’s terribly grammatically incorrect: “If you ain’t first, you’re last” – Ricky Bobby. That’s true in dentistry too. At Pike Lake Dental Center, we feel we are setting the standard for excellent dental care in the Northland and we aim to keep it that way. My bitewing x rays from 2001. X rays 20 years ago were totally old-school. I remember taking the film packets to the little film developing machine, plunging my hands into the tiny dark room and sending the films through the chemical developing process. 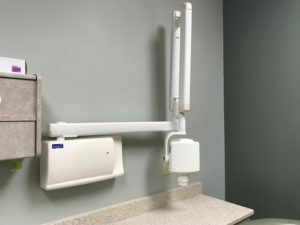 It would take a few minutes, but the completed bitewing or periapical film would pop out on the opposite end of the machine, dry and hopefully clear. We copied x rays in much the same way. Our darkroom also served as a storage closet and was located under the stairwell in the geodesic dome, the original home of Pike Lake Dental Center. Sandy and I would lock ourselves into the small space, block out all light, lay the film we wanted to duplicate over the blank film, process it under a special light, then secure the duplicated film into a light-proof case. It was back to the trusty developing machine to open up the light-proof case and send the duplicated x ray through the developing machine. Oh, the good ol’ days! One of our digital x ray units. When Dr. Matt invested into digital films a few years after we moved into our new building, it was a game changer. Not only are the films much clearer for our patients, the processing time is nearly instantaneous. Other benefits include less waste, there are no film wrappers or film to dispose of, less chemicals and less counter space without the film developing machine. Plus, the patient’s exposure to radiation is significantly less. There are also no more lead aprons for the patient to wear. Our 3D scanner and panorex machine. The panorex machine has changed drastically too. 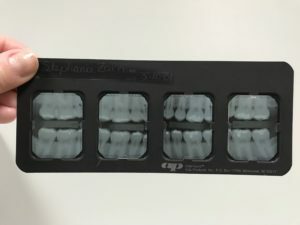 No longer do we take the large films and process them in the same fashion as the old bitewing or periapical films. 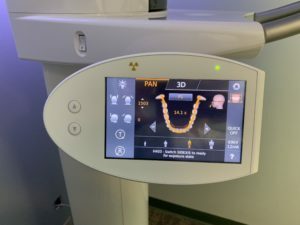 We now offer our patients a state of the art panorex machine which is also a 3D scanner. This machine is truly incredible. The 3D scanner can capture many different images for many different reasons. If we need to scan your airway to see if you’re a possible candidate for sleep apnea, we can do it. If you need a panorex x ray to aid in maintaining your oral health, we can do it. 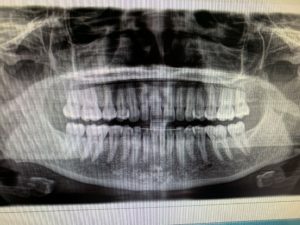 If there is an area of concern that we can’t capture on a bitewing or periapical x ray in the operatory, we can take a closer look with a more detailed scan. 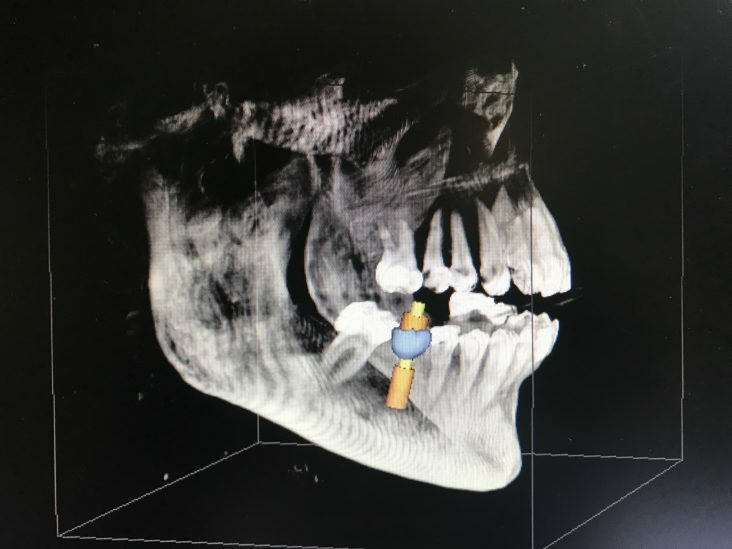 If you’re having a dental implant or a major dental surgery, the 2D and 3D scans allow us, and anyone else working on the case, to see a clearer view of the patient’s mouth, jaw and head. This machine is amazing! The benefits of a digital image are so important, not only for our patients but also for the environment. If we need to get images to a specialist quickly, we can send them securely via email, no more USPS or having the patient pick up their films to bring along with them. Conference call with a specialist? Both doctors can view the same image on their individual computers while on the phone together. What is the quality difference between film and digital images? The quality of digital imaging is vastly superior to the old-school film images. Not only are the images sharper, dental providers can manipulate the exposure of the image to see areas more clearly, making an accurate diagnosis easier. Imaging options on our 3D scanner. The move to digital imaging has also allowed our office to go paperless. What does a “paperless office” mean? The biggest change is the patient’s chart. We no longer have a physical chart for each patient. Instead we keep each patient’s records electronically, so all notes, films and pertinent information such as insurance cards, referrals and communication from specialists in one convenient place where any staff member can access it from any workstation. Going paperless has also cut down immensely on our paper usage. Of course, we still do need to use paper within the office, but it’s at a much lower amount now. The technology is COOL! I am completely serious – the technology is so cool. 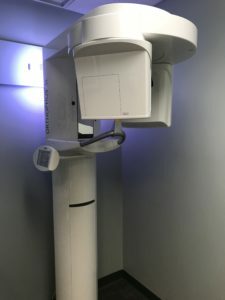 If you had told me how far we’d come in just the technology of x rays when I was standing in that little closet duplicating films 20 years ago, I wouldn’t have believed you. The ability to diagnose is much easier. With the improved quality of images comes improved ability to detect, diagnose and treat our patients. Safety for both our patients and our staff. The levels of radiation and chemical exposure are greatly reduced, producing a healthier environment all around. If we don’t stay on top of the ever changing technology, the chasm between the old and new technology just continues to grow and the leap into the new technology becomes harder and harder. A photo of my latest panorex. We are proud to offer this amazing technology to our patients. Whether you’ve been with us from the beginning or have just joined our practice or are thinking about becoming a patient, we strive to always be at the top of our game and provide you and your loved ones with the very best dental services available. Always.